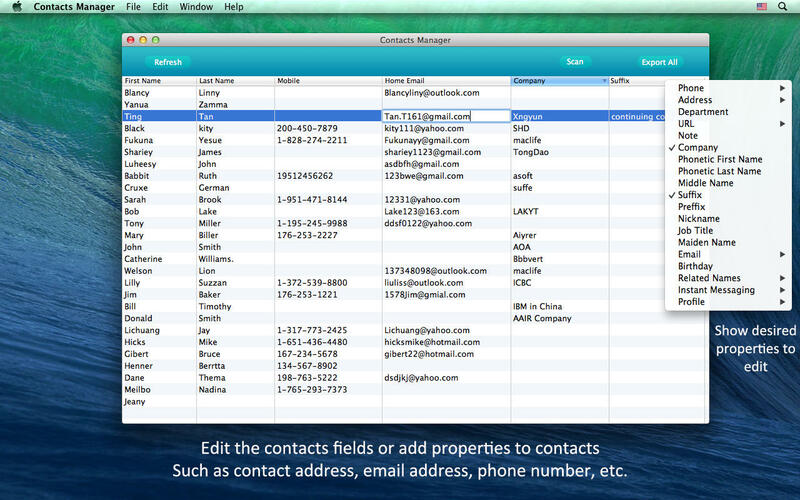 Contacts Manager is a professional app to manage your Contacts database, including export contacts, delete duplicates in Address Book, as well as analyzes, report and fix numbers of problems with Address Book, such as repeating fields, invalid characters and poorly formatted contacts names. Keep complete control over your contacts information, as contacts is one of the most important for your personal social network. 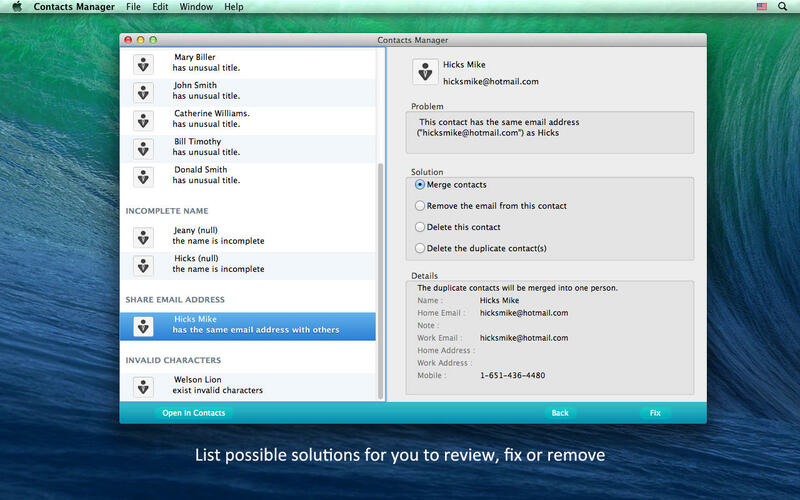 Contacts Manager lets you backup all of the contacts, edit the contacts fields, also can help you find and fix all the issues your Address Book presented. ● Export and backup contacts from your Address Book. ● Support export the whole Address Book or the selected contacts. ● Support totally 8 output formats and they are CSV, vCard, TXT, Docx, HTML, Excel, Numbers and Pages. ● Delete the duplicate contacts or invalid contacts. ● You can edit the contacts fields, such as contact name, email address, phone number. ● Support add properties to contacts, including contact address, email address, phone number, etc. ● Anything entered or added into Contact Manager will also sync in Address book. ● Scans your Address Book contacts for various types of problems including: duplicate contacts; duplicate contact properties such as postal address, email, and phone number; badly formatted names; invalid or unusual characters. ● List possible solutions for you to review, fix or remove. ● Automatic sync with Address Book. ● Yes, it works with OS X Yosemite(10.10)! Get Contacts Mnager to help you quickly find and remove the duplicated contacts in Address Book, or edit and fix the contacts in order. 1. OS X Yosemite(10.10) Supported! 2. Fixed the bug that can't open help document.